Home > video > Infiniti GT-R : Coming Soon or Never? Its no secret that Infiniti is the upscale brand of Nissan. Toyota has Lexus, and Nissan has Infiniti, both conceived as brands to sell a higher quality vehicle than people were used to getting from the Japanese manufacturers. Both companies founded in 1989. 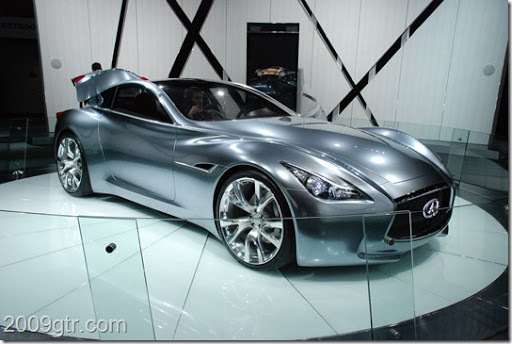 Infiniti has shown its Essence concept car at several shows and specialized events over the last few years. 592 hp, a hybrid. Twin turbo V-6. Its not really a Lexus LFA rival, but it would be a step up from the Nissan GT-R, which some owners might be happy about. There are always quiet a lot of gripes about taking their $80k or $90k car to the same place that services Sentras, and Cubes. The latest news reported by Car Magazine is that Nissan CEO Carlos Ghosn has at least been talking about the possibility of a Nissan GT-R powered Infiniti supercar. we have a lot of people saying "why don’t we use the power of the GT-R and give it an Infiniti body?" Ghosn told Car. "The idea makes sense. It’s a great car, the GT-R. Is it a project now? No. But I don’t want to give you the impression we’ll never do that. But I don’t want you to think that it’s coming in the next two to three years either. So, its not something that is happening right now, does that mean five years, eight years out? 2016, 2017, 2018 timeframe? I would be surprised to see the current GT-R last that long in production with the VR38DETT. If they drag it out that long, will it be direct injection, some kind of mild hybrid, 7 speed, by 2017-2018? They are going to need something to be able to comply with ever increasing emissions, and CAFE standards.